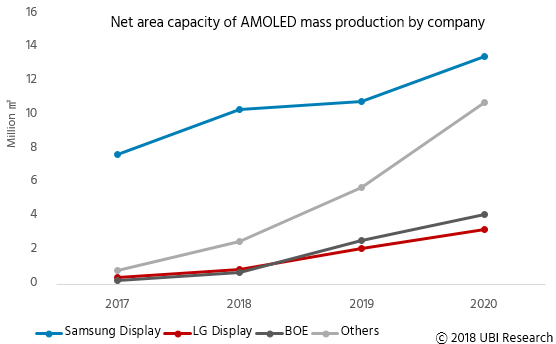 As a result of analyzing the glass area based on the overall equipment capacity, the net area capacity of AMOLED mass production was 13 million square meters in 2017, however, it is expected to grow more than three times to 40 million square meters in 2020. The data used for this report has been compiled, based on OLED companies’ information, though wired/wireless communication or in person, and participation in exhibitions, conferences, and seminars with the organizers’ consent. The market forecast data in this report has been collected through simulation based on expected operation rate and yield rate on the basis of UBI Research’s DB in accordance with investment trends and the technological level of Flexible AMOLED panel companies. A summary for quick understanding of entire report. Smartphone’s hardware performance has improved as much as possible and can no longer be the differential point within the market. Therefore companies are active in differentiating their products through flexible AMOLED applied designs and functions. A key smartphone production company Samsung Elec. is selling Galaxy S6 Edge more than anticipated, and Apple is also considering flexible AMOLED for the next model. However, as Samsung Display and LG Display are the only companies that can mass produce flexible AMOLED, the demand currently exceeds the supply. This report analyzed the sales trend of Samsung Elec. and Apple so far and forecast estimated sales until 2020. Through analysis of panel companies’ flexible AMOLED line capa. and number of flexible AMOLED applied smartphone, enabled forecast of key panel companies’ flexible AMOLED line investment timing. Compiled released flexible AMOLED panels by year for quick understanding. Analyzed key panel companies trends, including Samsung Display and LG Display’s, to understand the industry’s direction. Based on the traits of flexible AMOLED panels so far released by Samsung Display, LG Display, Japan Display, AUO, and BOE, analyzed the technical skills by companies. Samsung Display and LG Display’s mass produced flexible AMOLED panel structure and related equipment, supply chain related to material companies, and production process compilation. Based on the key flexible AMOLED panel companies’ mass production line situation and estimated investment plan of 2015-2017, this section was prepared to aid in business strategy planning of companies within flexible AMOLED value chain. Analyzed key OLED lighting companies’ 2015 trends to understand overall situation of the industry. Analyzed development history of key OLED lighting companies to understand OLED lighting development trend by company in order to deal with the market trend. Due to the Galaxy S6 Edge’s success and estimation that Apple’s next model will have flexible AMOLED panel, active flexible AMOLED investment by key panels is anticipated. Within OLED lighting, flexible is estimated to create high added value. With the active investment by key OLED lighting panel companies, including LG Chem., forecast it is estimated that market will actively grow. This report estimated, compared, and analyzed key OLED display and OLED lighting panel companies’ flexible OLED investment strategy and number of flexible OLED application. Through this, forecast flexible AMOLED panel, flexible OLED lighting market, and plastic substrate (key material for flexible OLED) market to aid in market analysis and business strategy planning. Analyzed last 3 years of SID’s flexible OLED related papers from diverse perspectives. Based on the 3 years of technology development trend, enabled technology development forecast. Summarized and compiled flexible OLED related key papers revealed in SID 2015. Expected to aid in understanding of recent flexible OLED related issues and technology trend. http://ubiresearch.com/wp-content/uploads/2015/05/Analyst-Column-Green-Light-for-Korean-Display-Industry.png 409 942 UBI /wp-content/uploads/2018/09/logo_vn.png UBI2015-05-08 18:33:172015-07-03 10:52:26Green Light Lit for Korean Display Industry?